It seems that the closer we get to the 2020s, the more enamored we become of the 1920s. Or maybe it's the fabulous clothes? 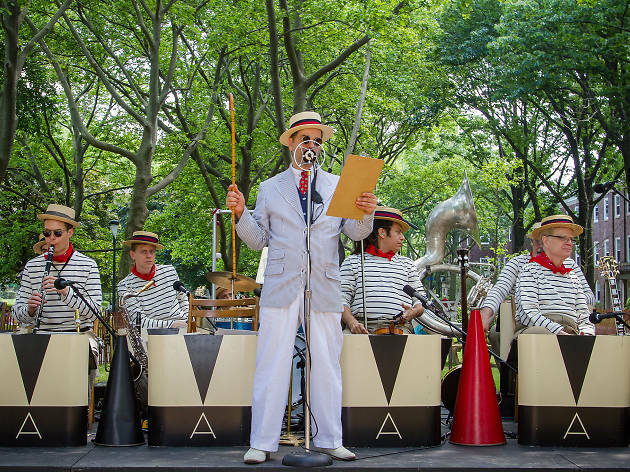 Regardless of the reason, this year's Jazz Age Lawn Party—those magical two weekends when Governors Island transforms into old-school East Egg—is going to be lit. This year's fest goes down on the weekends of June 10-11 and August 26–27. 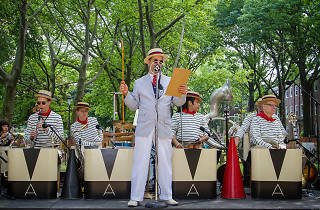 As expected, the bash will pack the grasses with as many old-timey delights of the age as possible—humongous gramophones, ’20s motorcars, vintage portrait stations, pie-eating and Peabody dancing competitions. Expect high-swingin' performances from creator Michael Arenella and His Dreamland Orchestra, along with Drew Nugent and the Midnight Society, Queen Esther and more. Early bird tickets are on sale now for $45, so jump on them before they go up. You can also opt in for more pre-recession luxury with options like the Jazz Baby ($120), which includes three cocktails; Bonnie & Clyde ($325), which includes a picnic blanket, two full meals and more goodies; and the Sheik of Araby tent ($5,000), which provides you and 14 guests with a private tent and full food and drink service all day. What are you waiting for? Get to steppin'!